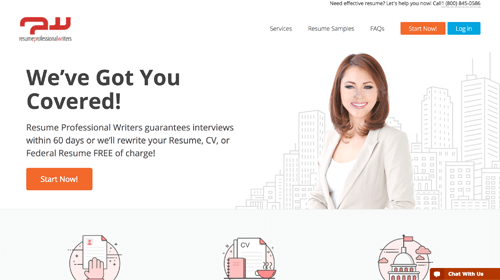 The guys over at ResumeProfessionalWriters.com got you covered. They guarantee interviews within 60 days and if that doesn’t happen, you get a free of charge rewrite of your resume, CV, or Federal Resume. Some of the services offered by them are the following: Resume Writing, to level up your job search and shine above the rest, CV Writing, to present your competencies extensively in the best light, and many more you can discover for yourself by visiting their user-friendly website. With more than 100,000 unique powerful resumes written so far, they are to be trusted. Looks cool? Resumance wouldn't say so. Pricing is okay. It’s definitely not a steal to order from them is all I can say. Does the quality justify the prices? Perhaps, but their service is pretty expensive nonetheless. 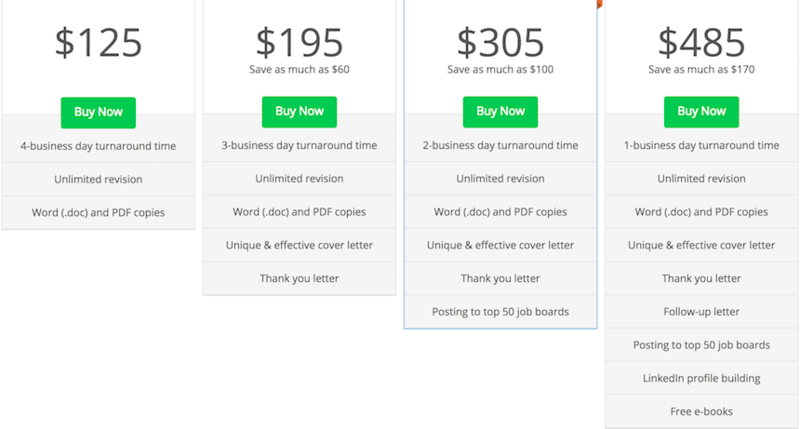 It starts at $125 for the basic resume and can reach half a thousand for the ultimate resume. If a discount can be applied then sure, but if not, $485 seems too costly. Making a payment is easy and straight-forward. After you’ve selected your package, you will have to fill in your personal and credit card information. They accept Visa, MasterCard, American Express, and Discover. You can also pay with PayPal. The delivery is quite fast. It’s customizable as in you can pick how long it takes for your paper to get to you. But not as customizable since delivery time is strictly bound with the package you choose. It takes 1-4 business days turnaround time. Customer service is decent. There’s a chat window that pops up as soon as you enter their website and I tried to leave a question but I was greeted with the message "We’re not online right now." Besides that, customer service is not hard to reach, so the service overall is not terrible. Website usability is great. Every bit of information is at your fingertips, prices along with packages are always on screen so you won’t have to wonder, and the design of it is friendly and welcoming. There’s no obnoxious ads popping up in your face, and if you don’t need any info you can just click on Get started and that’s it. I’ve read multiple ResumeProfessionalWriters reviews before deciding to try them myself and write this. My experience is slightly worse than others. I went for the basic package just to try them out. Payment went through with no problem, delivery was okay, just a few minutes before the deadline, and the customer service was very easy to reach. I had to get to them since my paper seemed like it was going to be late and I wanted to check if everything was alright. The thing that demoralized me the most was the actual quality of the paper. It wasn’t bad, but it didn’t justify the price I had to pay for it. It was in no means spectacular, just your regular resume with some fancy words thrown in there. There were no mistakes whatsoever, so at least I didn’t have to deal with a revision.